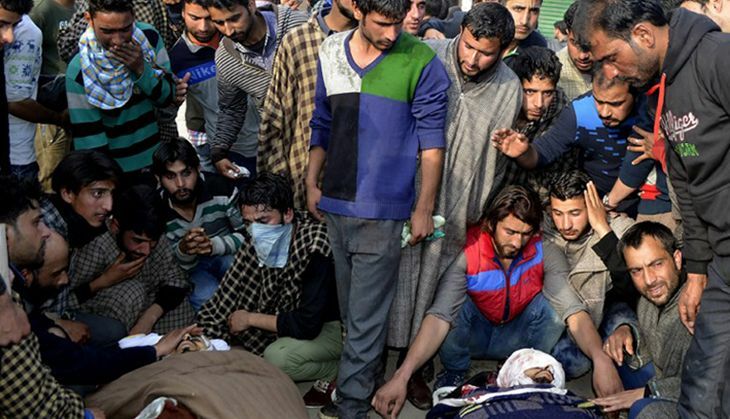 Three men were killed and others injured on Tuesday when the Army opened fire on a crowd protesting the alleged molestation of a girl by an Army man in Handwara, Kashmir. Villagers allege that at about 3.45 pm in the afternoon, an Army man attempted to molest a girl in a washroom near an Army bunker in the town's main market. A crowd gathered to protest the incident, whereupon the Rashtriya Rifles as well as J&K Police allegedly opened fire. According to a local shopkeeper, "As the girl raised an alarm, it caught the attention of locals and students, who rushed inside the washroom and tried to catch hold of the Army man. However, he took shelter inside the bunker." He added: "The protesters attacked the Army's border patrol vehicles and the police station...several protesters sustained injuries in the clashes." That was when the Army opened fire, he said. Media reports quoted Chief Minister Mehbooba Mufti as saying that those responsible for the killings would be punished. CM Mufti condemned the killings, saying that such incidents had a "negative impact on the Jammu and Kashmir government's efforts to consolidate peace. The head of the Northern Command, Lt Gen DS Hooda has reportedly told the CM that the Army has ordered a probe into the incident. The Jammu and Kashmir Police have also registered a criminal case in connection to the incident. Additional police personnel have been deployed in sensitive areas of the city to maintain law and order. The Times of India reported that Hurriyat Conference has called for a shutdown.